Ready to floor your guests with your brand-new Quick-Step wood floor? Not so fast! How about a nice skirting board to take the edge off, or a profile to ease them in? Here’s everything you need to complete the picture. 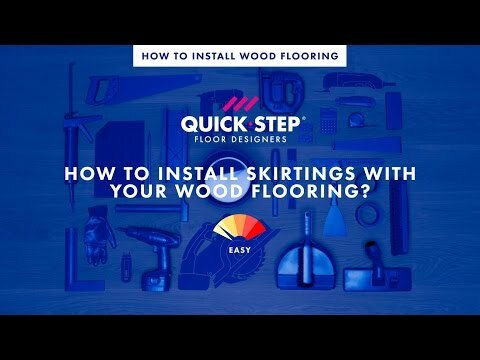 Why Quick-Step skirting boards and profiles? For every Quick‑Step wood floor there's a skirting board and profile in a perfectly matching colour. Equipped with a quality veneer surface, Quick-Step skirting boards and profiles can really take the rough and tumble of everyday life. 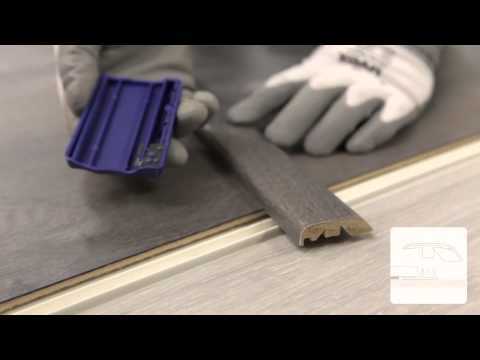 Quick-Step skirting boards and profiles can be installed in no time. Thanks to our wide-ranging collection, you’ll always find a skirting board that matches your floor, taste and style. What’s more, every skirting board has been quality tested and comes with a complete Quick-Step guarantee. A discreet finish to your floor. Can also be used as a finish in combination with existing skirting boards. The clean lines of the Parquet skirting board add a classy finishing touch to any plank floor. The back of the skirting board is fitted with a groove to hide phone or computer cables. A nice finish for round pillars or curved walls? No problem with this paintable flexible skirting, made of flexible, yet solid foam. This skirting board is 4 cm high and 1.4 cm thick and can be cut to the exact length that you need. Plastic track for installation of the parquet skirting boards. Can be attached to the wall with screws or with Quick-Step One4All glue. Simply click the skirting board onto it and you're ready to go. Matches in height and width with the flexible paintable skirting, enables you to finish the rest of the room in the same style. Ovolo is a multi-purpose paintable skirting board. Equipped with Incizo technology, it can be cut to the desired height. Choose your preferred height and play around with the near-endless options and combinations. This paintable skirting board cover can be placed over your existing skirting boards. Installation is quick and there's no risk of damaging your wall. Choose the height and width of your skirting board thanks to its incizo technology. With the patented Quick-Step Incizo profile, you can give your wood floor or even your staircase a perfect finish. No matter what Quick-Step floor you like best, there’s always a perfectly matching colour available. To be used in combination with the Incizo profile for application of Incizo on stairs or steps. This veneer profile, with patented Incizo technology, is extremely handy to give your floor and stairs that perfect finish. You can use one and the same profile for all finishing situations: between two floors of the same height or with difference in height, as a transition to a wall, window or carpet, ... . Simply cut the basic Incizo profile to the shape required using the supplied slitter. Screws and plugs included. For application on stairs or steps, please order the Incizo aluminium subprofile for stairs separately. Still have the feeling something’s missing? Try these extras for that much-coveted extra touch. This elastic, acrylic-based paste is the ideal solution for those spots where you cannot install skirting boards or profiles. It’s available in a colour fitting your floor. The Quick‑Step Hydrokit is a transparent silicone for an invisible and waterproof finishing of skirting boards, profiles,… A perfect solution in combination with the Quick-Step waterproof laminate ranges! In order to achieve the 10 year wet area warranty applicable on those ranges you must use the Hydrokit and PE Foam as per the installation instructions. 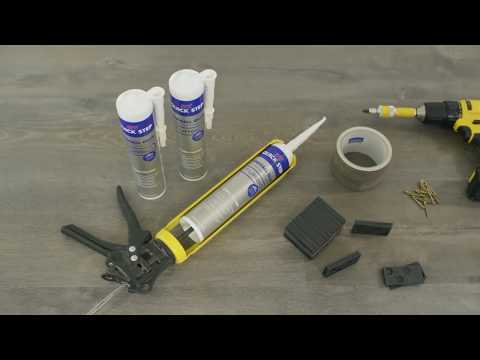 This multifunctional One4All glue is specifically developed for all applications with the Quick-Step solutions. It is perfect for quick and firm fixing of all the skirting boards to the wall, and for use with the Quick-Step Incizo profile and its sub-profiles.